In this update, I’ll preview PnPG blog content I’ve got in the works for the rest of the fall, including my experiences with the Kickstarter for Steve Jackson’s The Fantasy Trip; mini-modding tutorials in video format; a PnPG Downloads page, collecting all downloadable content from the site, past, present and future; coverage of the backlog of great new print-and-play minis that has accumulated over the summer; and of course, the never-ending saga of my move! 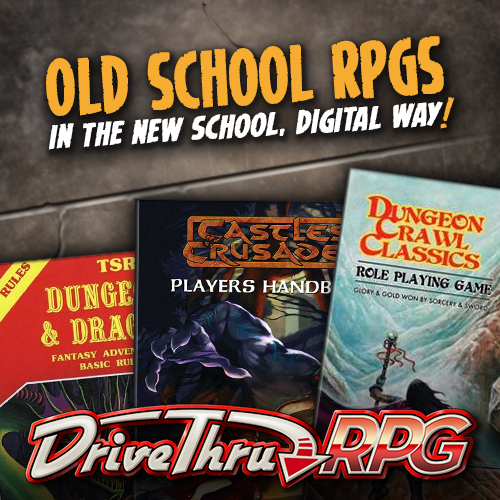 The Fantasy Trip Debut: Melee and Wizard PDFs coming! As I write this, on September 18, 2018, I’m all a-jitter with anticipation of the first backer reward for Steve Jackson Games’ Kickstarter re-launching the OSR classic, The Fantasy Trip. Tomorrow, we backers should be receiving PDF versions of Melee and Wizard, the martial and magical combat systems that form the foundation of The Fantasy Trip. The physical games won’t ship until next spring (and yes, I backed at the “I Want It All” level, and I’ve added extra stuff in BackerKit), but SJ Games is making it possible for print-and-play gamers like us to begin playing six months early! My hopes are really high for TFT. In the course of packing and unpacking almost forty years worth of game books last month, I came across my original copies of Advanced Melee, Advanced Wizard, and TFT: In the Labyrinth. I remember the game as amazingly cool, elegant and fast-playing, yet with a wealth of tactical and strategic choices to make on every turn. And the game system is pretty much as cool as I remember it, but the original rule books, not so much. For a variety of reasons, most reflecting poorly on the original publisher, Metagaming, the TFT rule books were not nearly as elegant as the game system they described. I hope that Steve has taken the opportunity to turn TFT into the game it always should have been, instead of the half-hearted booklets that Howard Thompson actually published nearly four decades ago. Rest assured, I’ll be printing out both games and binding the rulebooks as soon as I get my PDFs, and I’ll be playing immediately after that. I’ll share my first impressions here, some time in the next week or two. Fingers crossed! As I mentioned in my last update, I’ve picked up the necessary software to record and edit video tutorials. I’m putting together a list of topics and techniques to share in my first few videos. I’ll probably begin with video versions of the PDF formatting and mini-recoloring technique in my text-and-screenshots tutorials, Format Miniatures in a PDF and Recolor Printable Minis with GIMP. I’ll follow that up by showing you how to scale and flip minis to expand your collection for free; how to create new minis from found images; and how to make custom tuck boxes to store your minis. If all that goes well, I’ll try shooting live-action video, which will let me demonstrate assembling cardstock miniatures and models, including the great buildings from Dave Graffam I’ve told you about in the past. I’ll also be able to show you how I print and bind my PDF game books into durable, professional-looking physical books. I may even do battle reports of actual gameplay using cardstock minis and wargaming rules like Advanced Song of Blades and Heroes and Frostgrave. There’s lots more that I’ve been dying to share that doesn’t come across in text, so stay tuned! I’ve been procrastinating creating a Downloads page, but an inquiry from PnPG reader Pieter Vreeberg reminded me how useful such a page would be. Pieter tripped over my Dungeons of Olde project, which consisted of a tabletop RPG/skirmish/dungeon-crawler rule set and an associated system of modular, 2.5D printable dungeon terrain tiles. The mostly unplaytested basic rules for the Dungeons of Olde game can be found at dungeonsofolde.com, while a couple of versions of the tile set have been posted there, as well as at the Cardboard Warriors forum and in the 2017 Papercuts section of the OneMonk.com website. Very soon, however, I’ll bring all that together here at PnPG as featured content on a new PnPG Downloads page. I’ll also include all the PDFs I’ve shared in previous posts, as well as several new pages of minis. When that page drops, you’ll have a bunch of new, free stuff to print and play! This summer, all of my favorite printable miniature artists have produced several new minis, or many new sets. During my move, I’ve fallen behind on assembling, but I’ll get caught up over the next few weeks. As I do, I’ll share photos of these great new figures, and tell you where you can find them yourself. (Spoiler alert: Most of them are at DriveThruRPG and Patreon, but a few are hiding out in less obvious locations!) I’ve got at least a couple hundred figures on my hard drive that have yet to make it through the printer and onto the table. The move which has interfered so badly with both my blogging and my gaming continues to progress slowly. I’m typing this in my new basement office/game cave…sort of. Actually, I’m sitting at a folding table behind a fortress of boxes, and the second-hand dining table which will be the main gaming surface is currently buried under an assortment of tools and home-repair materials. So…we’re here, but here isn’t quite there yet, if you know what I mean. I’m probably a couple of weeks away from having a proper desk, and a couple of months away from hosting actual game sessions. But I should be able to afford the time to resume playing at my local game club and store by next week, so that’s progress, right? Bear with me…the long wait is almost over. And in the meantime, you should keep printing and keep playing, even if I can’t for a few more days!